Funded by the Macular Society, we have been able to create a disease model in the lab which we can use for various studies. Our model uses patient skin cells and by introducing four genetic factors, we are able to generate stem cells which have the ability to make any cell type including retinal cells. We can coax these patient specific cells to become retinal pigmented epithelial cells (RPE), which are the primary affected cells in the AMD patients. We chose patients with the most common genetic risk factor for the disease which causes a change in the immune and inflammatory system. Our studies to date show that this “lab made model” mimics the key features of AMD, such as increased inflammation, reduced ability of the cells to cope with external stresses and deposition of waste products that are very similar in composition to the drusen deposits observed in AMD patients underneath the retina. Our preliminary findings indicate that the cellular recycling system that is vital for vision is affected in these cells. Dysfunctions in the recycling system are implicated in a number of degenerative and age related diseases. A block in this system leads to waste material build-up which has the potential to cause damage and even cell death. It is unclear if changes in this system are caused by or an effect of the disease. Using our model we hope to understand which step in the recycling process is affected in AMD. We can block the recycling process at many stages allowing us to dissect the exact mechanism by which this process leads to AMD. Identifying if cellular recycling is an underlying cause could lead to new drug treatments to treat the disease directly in its early stages preventing its progression and later consequences. 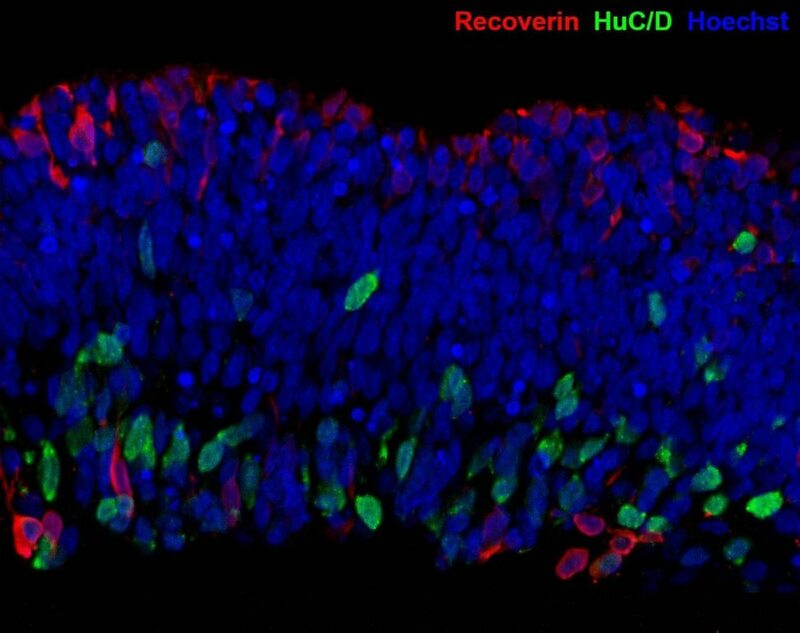 The generation of human retinal tissue from stem cells has been a pioneering breakthrough. Pluripotent stem cell derived retina: immunocytochemistry analysis at day 35 of differentiation. The generation of human retinal tissue from stem cells under laboratory conditions has been a pioneering breakthrough which has transformed the field of ophthalmic research, yet this approach needs to be further developed so that human retinal tissue can be produced more efficiently and reproducibly from different patient's stem cells. Develop preclinical tools that will enable us to select functional retinal cells for retinal cell replacement therapy in humans. This is an exciting, high risk and high gain project that is projected to enhance the treatment of retinal degenerative disease. Moreover, the efficient generation of retinal "mini-organs" in a dish will allow us to create models of retinal disease that can be used for large scale drug testing and clinical cell-based transplantation trials, all of which have not been possible so far due to difficulties in accessing patient-specific retinal tissue. This project is funded by the European Research Council and RP Fighting Blindness, UK and is being developed in close collaboration with Dr. Evelyne Sernagor and Dr. Geritt Hilgen at the Institute of Neuroscience and Prof. Susan Lindsay at the Institute of Genetic Medicine (Newcastle University). Our approach to deriving patient specific induced pluripotent stem cells (iPSC). Retinal Disease modelling with iPSC, Retinitis Pigmentosa (RP) and Mitochondrial encephalomyopathy, lactic acidosis, and stroke-like episodes (m.3243A>G mitochondrial DNA mutation) using a patient specific induced pluripotent stem cell (iPSC) approach. In the last three years we have derived iPSCs from AMD, RP and m.3243A>G mitochondrial DNA mutation patients and have generated patient-specific photoreceptors and retinal pigmented epithelial cells which we are using to understand the cause and progression of these diseases as well as developing targeted strategies for moving forward with therapeutic interventions. These projects benefit from Fight for Sight UK, Macular Society UK, EbiSC, Bayer, AHSN, Novartis and Newcastle Health Charity funding and are underpinned by close collaborations with Dr. David Kavanagh (Newcastle University), Prof. Colin Johnson (University of Leeds), Dr Sushma Grellscheid (University of Durham), Dr. Viktor Korolchuk (Newcastle University) and Dr. Patrick Yu-Man (Newcastle University). Despite our increasing knowledge, there is a lack of information about the optimum method of cell delivery. Despite our increasing knowledge of the type and developmental stage of cells that may be transplanted in order to treat retinal disease in animal models, there is a lack of information about the optimum method of cell delivery. Current techniques using fine bore cannulas can damage the cells during injection to the point where they lose function and/or viability. Dead or dying cells have significant detrimental effects on the living cells around them. In addition, some cells are either retained within the cannula or lost by reflux following injection. This means that significantly fewer functional cells than the optimal prescribed dose are delivered subretinally. Furthermore, once the cells have been delivered they can often assume an uneven distribution with clumping and aggregation a common occurrence, rather than forming an evenly dispersed layer which would optimally be desired. We are investigating the process of the delivery of cell suspensions into the subretinal space with the aim of overcoming these problems using a variety of different approaches. We are working with industry and major grant funding bodies which we will feed into our long term aim of developing our own cellular therapies to help restore vision to those who are blind as a result of outer retinal disease. We are actively participating in current clinical trials of cellular therapies. Our group is also actively participating in current clinical trials of cellular therapies and Mr Steel participated as a Phase 1 principal investigator in the ground breaking Ocata (now Astellas Institute of Regenerative Medicine) therapeutics trial of embryonic stem cell-derived RPE cell transplantation into the subretinal space in patients with Stargardt's macular dystrophy. Mr. Steel is developing links with other companies involved with subretinal cellular therapies to bring these innovative new treatments to the clinic in the fastest possible time frame. 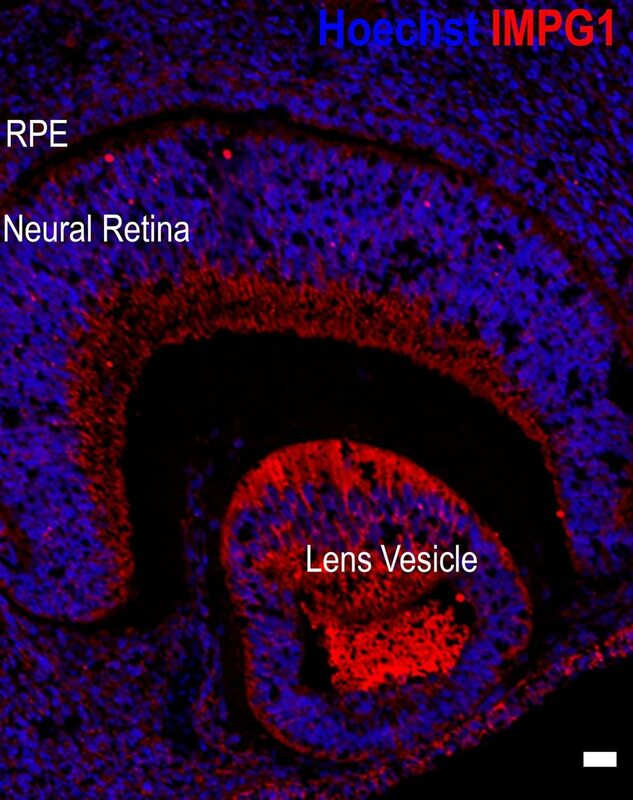 Expression of IMPG1 in developing human retina at six weeks post-conception. Vision loss can occur through the effect of faulty genes we inherit from our parents as well as the accumulation of damage and the effect of various diseases throughout our lives. Our ability to prevent and treat vision loss is closely linked with our knowledge of "how eyes form" and when and what is likely to go wrong. Our eyes develop mostly before birth and the availability of tissue to study from this time period is very limited. Our group is in a unique position, having access to normal eyes through a tissue resource jointly established in our Institutes which collects samples from aborted embryos and fetuses with the mother's consent (www.hdbr.org/). Our aim is to use these samples to understand how and when parts of our eyes form, how they function and interact together and the role of genes that cause loss of vision when faulty. This project benefits from close collaboration with Prof. Susan Lindsay's group at the Institute of Genetic Medicine in Newcastle, Human Developmental Biology Resource (HDBR) and funding provided by the European Research Council (ERC). In December 2018, MRC funded a new collaborative project (scEye-Map) between Prof. Fitzpatrick's group (Edinburgh University), Prof. Sowden's group (Institute of Child Health) and Prof. Lako's group to investigate early eye development at single cell resolution.